Hollywood legends Arnold Schwarzenegger and Jackie Chan are joining forces as part of the cast for the Russian-Chinese fantasy adventure movie titled Viy-2. Producer Gleb Fetisov made the announcement on Monday that Schwarzenegger joined the cast of the production. The film is the next installment to the 2014 Russian box office smash hit based off 19th century Russian writer Nikolai Gogal's horror novella, according to Variety. The first movie of the series grossed $34.6 million, which made it the year's top grossing local film in Russia. The upcoming sequel is also being called Journey to China: The Iron Mask Mystery. The plot for the upcoming movie follows an English traveler named Jonathan Green, who is ordered from Peter the Great to create maps of Russia's Far East. "Once again he sets out for a long journey full of incredible adventures that will eventually lead him to China," according to a statement retrieved by Yahoo. "The cartographer will face many breathtaking discoveries, encounter bizarre creatures, meet with Chinese princesses, and confront deadly martial-arts masters and the Dragon King." The cast of Viy-2 features Jason Flemyng (Lock, Stock and Two Smoking Barrels), who also appeared in the first film, as the lead character Jonathan Green. Other actors in the upcoming film include Schwarzenegger (The Terminator), Chan (Rush Hour), Charles Dance (Game of Thrones, The Imitation Game), Martin Klebba (Pirates of the Caribbean: Dead Men Tell No Tales), and Christopher Fairbank (Guardians of the Galaxy). Alexey Petruhkin, a producer on the film, said during an interview with RIA Novosti: "Viy-2 features the best Chinese actors: Yao Xingtong, the Luu Brothers, Zhang Lanxin (2004 Chinese taekwondo champion). Moreover, Jackie Chan and his company Jackie Chan JCE, responsible for the shooting in China, are taking a very active role in the creation of the movie." Viy, the first film of the series was released two years ago and is known internationally as Forbidden Empire. The film, which is budgeted at $48 million, was shot in China and is now in post-production. The director was Oleg Stepchenko with the screenplay being penned by Stepchenko, Dmitry Palcev, and Petrukhin. Viy-2 is expected to be released early in 2017. Arnold Schwarzenegger's upcoming projects include The Legend of Conan, and Aftermath, which expected in 2016. Jackie Chan can be seen next in Railroad Tigers and The Foreigner, both expecting a 2016 release. 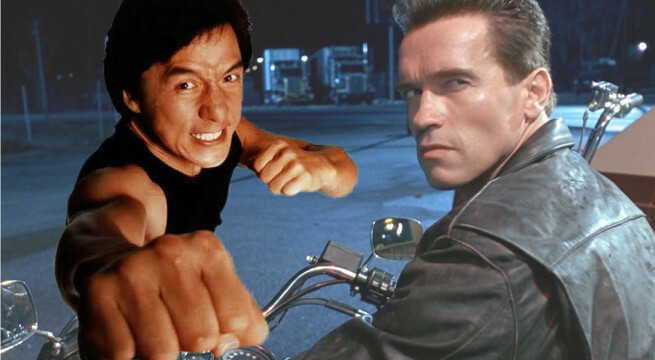 Are you excited to see Jackie Chan and Arnold Schwarzenegger team up for the forthcoming Russian-Chinese adventure flick Viy-2?